Will China meet its energy-related targets under its 12th five year plan? Did you see the photos like the one above out of Shanghai? 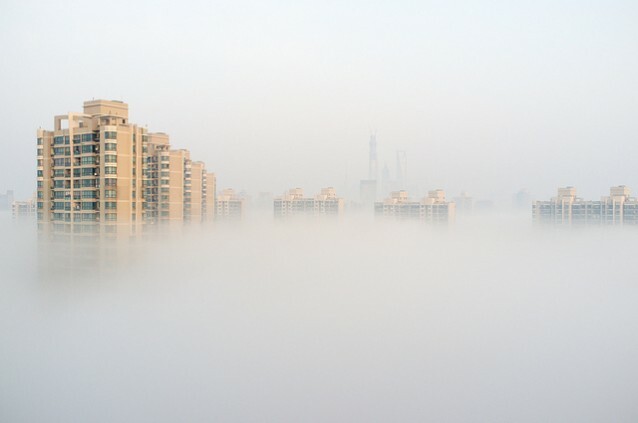 For the first time ever, Shanghai’s air pollution, like Beijing’s before it, exceeded the scale for particulate matter. For the past seven days, the air quality has been so bad that schools and flights were cancelled, cars were forced off the roads, industries were shut down (Though a marathon last Monday went on as planned. Runners complained that their lungs hurt. Go figure!). 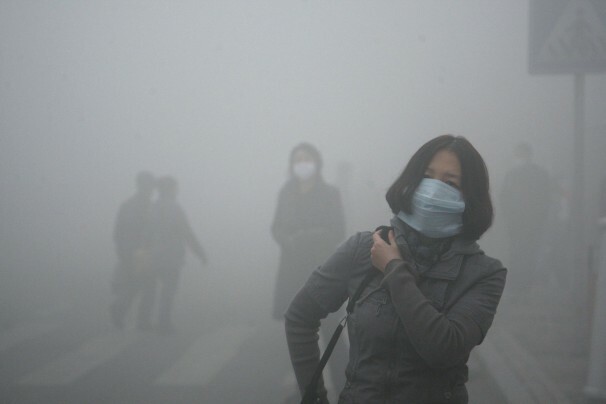 Can China Get a Handle on Pollution? What Does that Mean for Climate Change? In the northern city of Harbin, China, air quality was so bad ten days ago that concentrations of particulate matter reportedly reached 1000 micrograms per cubic meter at their peak, exceeding the World Health Organization’s daily safe levels by a factor of 40 and shrouding the city in a fog so dense that commuters had trouble finding their way and a numbers of schools were forced to close. As China’s pollution has reached intolerable levels, the air quality problem may pose an opportunity for China to address not only its dirty air but also its greenhouse gas emissions, as actions to reduce air pollution may produce co-benefits for climate change. China’s awful pollution situation and whether action to address climate change were the main subjects of discussion for a number of scholars and practitioners last Friday in a Webinar hosted by ChinaFAQs*. I was fortunate to be among the presenters, and though the event itself was subject to Chatham House rules, I’m making the first of my two contributions to the event available as a blog post (the second will follow shortly). I’ve written on China, climate change, and energy in the past for CNAS and RFF. For me, this Webinar was timely, as I have just started a year long MA class on sectoral greenhouse gas emissions reductions strategies by the major economies. Our class has a group blog which we hope is a great resource for those interested in the domestic implementation challenges of climate change policies by the world’s major emitters. In the comments that follow, I take up the issue of whether China can get its act together on air pollution and what this might mean for climate change. Transboundary and global environmental threats require collection action. Concretely, this means developing forms of governance that apply common rules, norms and decision making procedures. Ideally, such governance should be resilient in the sense that it is able to persist over time and respond quickly and accurately to new threats. Yet the record of international environmental governance is mixed, at best. According to a recent UNEP overview of global environmental governance, some regimes have effectively addressed the problems at hand, many haven’t, and we still don’t know about the effectiveness of a surprisingly large number of regimes. A recent collective project on international environmental governance (here and here) raises the questions of what configurations of actors can constructively promote better environmental management. Is Rio + 20 Going to be a Waste of Time? Rio+20, the twentieth anniversary of the 1992 Earth Summit, kicks off the formal part of the negotiations tomorrow as leaders of 130 countries arrive to take part. It strikes me as a misguided nostalgia tour and will probably achieve even less than the tenth anniversary that took place in South Africa. Environmental indicators continue to deteriorate but sending 50,000 people to Rio (40,000 of them environmentalists) is a waste of time and energy (literally as Joe Biden would say). How the times have changed. In 1992, President George H.W. Bush, facing a tough reelection, made an appearance in Rio to shore up his green credentials. This time, President Obama won’t be going. Nor should he. Not much will happen there. We a new approach to conserve the resources of the planet both at home and abroad. Here at home we need to convince Republicans that environmental protection is a conservative value. Internationally, we need to persuade countries in Asia that is in their interest to pollute less and be more efficient in their use of energy. Environmental protection will save lives and money. But the low expectations also reflect a broader dynamic: what might be called “big-bang multilateralism”–in which the world’s nearly 200 sovereign states attempt to hammer out complex agreements–is mired in a losing streak. Let me also remind you that sustainable development is not at all just about the environment, and this conference is not an environmental conference. This conference is a development conference. Nature issued a pre-Rio report card on how the world has fared on three core environmental problems, climate change, biodiversity, and desertification. 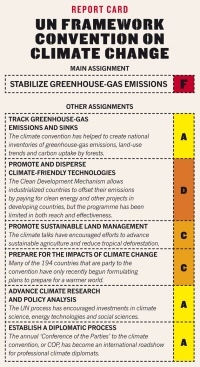 The results are dispiriting, an F for stabilizing greenhouse gas emissions, an F for reducing biodiversity loss, and an F for reversing desertification and land degradation. If this seems a depressing scene-setter, the Rio summit is not fated for failure. It may yet exceed expectations with a low-key approach focused less on the painstaking negotiation of treaties than on generating practical national commitments to advance sustainable development. I think thematic meetings, organized around non-binding commitments on a particular issue, are likely to be more successful than catch-all meetings like this one. Despite my pessimism, if nothing else, Rio+20 may have at least one positive benefit. With world media focused on the host country, on May 25th Brazil’s President Dilma Rousseff vetoed key clauses of a land law that would have opened up the Amazon to deforestation. Looking ahead, the environmental community needs to rethink how to approach these issues. In the United States, the challenge is clearly about making the environment a bipartisan issue again. Democrats own the issue and that is bad for the environment. Internationally, advocates for environmental protection need to be more creative. David Victor and Leslie Coben wrote a piece some years ago that suggested there was a herd mentality among environmentalists who tended to embrace legally binding international commitments as the only way forward. While that has started to change, faith in piecemeal bottoms-up efforts seems to me like small ball. In between are more ambitious efforts like what Simon Zadek proposed — green unilateralism by the major actors. Rather than seeking to contain this unilateralism, world leaders should leverage it in pursuit of global public goods. Such a strategy’s success depends on three factors: a focus on a small number of big-ticket national and regional actions, adequate policy leverage over these actions, and international coalitions to steer them along a legitimate path. This is an agenda I can finally get excited about. This is re-posted from e-IR. I hesitated to write anything about climate and security until I had read all (or damn near all 17 articles) of the recent special issue of the Journal of Peace Research. My initial mandate for this post was to talk about the significance of climate and security for militaries, and as part of a project funded by the U.S. Department of Defense, I obviously should have something to say about that. My reaction, however, was that to conceive of climate and security as purely or primarily a military problem would reinforce a narrow understanding of the issue and potential solutions. Is Climate Security the Military’s Problem? If climate security becomes a military problem, then a whole host of other interventions, mostly by civilian agencies involved in development, adaptation, and disaster preparedness, have failed. Thinking about climate and security in terms of the military runs the risk of framing the issue in terms of how to get the Pentagon interested in this problem (here I’m echoing Dan Deudney’s concerns from the 1990s on securitizing the environment). This tends to reinforce the emphasis on conflict or terrorism when other potential security outcomes may be as, if not more significant and proximate threats (here I’m thinking of complex emergencies wrought by climate-related disasters). When militaries are interested in this issue with the hope of doing something, they have to recognize their limitations and core competencies. The extension of militaries in to the international development sphere is problematic, as the challenging experience of reconstruction in Iraq and Afghanistan attest. International development supported by foreign donors is fraught in any case, and militaries are recent entries in to this arena. They don’t have more than a half century of experience making mistakes in development so may think about these issues in primarily technocratic terms, drilling a well here or building a dam there when these are but a piece of an overall problem that includes challenges of country ownership and cultural sensitivities. Obviously, some militaries have more experience than others, and the U.S. government surely learned a lot in Afghanistan and Iraq. That said, just because some militaries, particularly the Department of Defense, are better resourced than their civilian counterparts doesn’t necessarily mean that they are (or even can be) well-suited to doing the development piece of the climate security agenda. There are some things that militaries can and should do. First and foremost, militaries have to prepare for potential existential threats to the nation and its way of life. As I’ve written before (see here, here), there are some albeit limited ways that climate change poses a direct threat to the United States (to military bases, critical infrastructure, coastal populations, and possibly the Arctic). There are also indirect threats to a country’s overseas interests. Here, one has to have a clear sense of its strategic interests and where the vulnerable areas are. 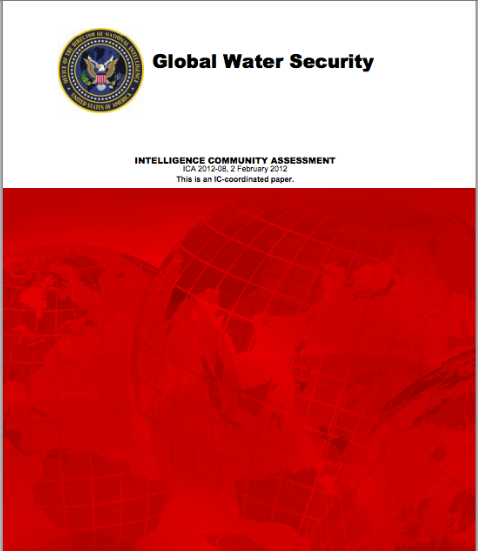 For the latter, militaries are reliant on intelligence assessments like those provided by the National Intelligence Council (including their 2008 report and their 2012 report on water security) and need to consider climate security impacts in their operations as the U.S. Department of Defense 2010 Quadrennial Defense Review does. 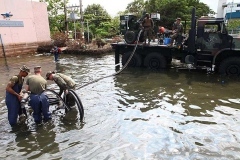 Beyond intelligence gathering and strategic assessments, militaries have ample experience with disaster response and military-to-military disaster response training. This is all well and good. The challenge becomes when the military would like to be proactive and think about conflict and disaster prevention and preparedness and de-escalation of tensions. Many of these tasks may involve diplomacy and development, specialties of other agencies like the State Department and USAID. The combatant command for Africa (AFRICOM) was initially designed to try to bring the diverse expertise of the U.S. military together with the State Department and other elements of U.S. national power. Indeed, one of its two principal deputies was to be a State Department career diplomat. The experience thus far suggests that the venture to integrate diplomacy and development into a strategic military command is extremely challenging. What’s an answer, if not the answer? In light of these concerns, what is to be done? Here, I would say two things (1) “Answers” to the extent we have them must be context-specific and (2) Look before you leap. Let’s say you think that issues related to river basins are likely to be a problem in a world of climate change with decreased water flows and increased demand. What is to be done? Well, the answers may vary greatly. The Nile River Basin has a very different set of issues than the Zambezi. For example, Zimbabwe and Zambia share a river border along the Zambezi, giving them roughly equal leverage. The Nile which snakes from Uganda to Egypt has upstream/downstream issues associated with geography and history. Upstream countries like Ethiopia ostensibly possess more bargaining leverage by virtue of their ability to divert water and cut off downstream access. In practice, however, Egypt and Sudan have rights to 80% of the Nile’s water dating back to a 1929 colonial era treaty. Upstream countries like Ethiopia with rising ambitions and needs are seeking to challenge this imbalance, which has triggered some bellicose rhetoric on the part of Egypt at a moment of political turmoil and transition. Would insertion of the U.S. military, let alone the broader U.S. policy establishment, be helpful to ensure that this process ends amicably? Probably not. Even if U.S. engagement were useful, context matters a lot, and the policy community would be wise to take the time to assess the full picture before trying to wade in. To the extent that there are generalizable lessons about climate and security, the policy community, including but not limited to the military establishment, would benefit from a richer understanding of the academic literature on the topic. One of the biggest potential errors is to blithely accept the simple premise that “climate change will cause conflict” and then move on to think about what to do about it. In fact, the literature on the topic is much more mixed and nuanced. While the policy community frequently notes that climate on its own won’t cause conflict (see the QDR statement for example), that it is a threat multiplier, the operating assumption is often that climate change will exacerbate water scarcity and that will trigger conflicts. Far stronger evidence suggests that conflict onset is more likely triggered by periods of higher rainfall not lower rainfall (see my CCAPS colleagues Hendrix and Salehyan’s piece in the same issue of JPR as well as my other CCAPS colleague Clionadh Raleigh’s piece with Dominic Kniveton, as well as Adano et. al’s piece and Thiesen’s paper in that same issue). Moreover, no longer are we talking about civil wars and organized rebellions but when we talk about conflicts associated with heavy rainfall, we’re really talking about violent events that require less organization like protests, riots, strikes, and cattle raids like those captured in the new Social Conflict in Africa Database (SCAD) and the Armed Conflict and Location Event Database (ACLED). Coming back to the topic of river basins, if one were to uncritically accept the scarcity-conflict nexus, then one might be inclined to think that we were on the verge of series of water wars. However, as Aaron Wolf’s work suggests, most issues of international rivers have historically been resolved peacefully. Indeed, as the Tir and Stinnett piece in the JPR issue finds, one of the reasons river basin water issues have not generally degenerated into conflict is because of transboundary river agreements. So, if the policy community is starting to accept the connection between climate and conflict, but the academic commnunity hasn’t found much thus far, how can we explain the disconnect? The field of climate and security is relatively new and is especially difficult to study since we’re trying to understand the effects of a problem that has for the most part yet to occur. Most studies (the Devitt and Tol JPR piece is a notable exception) look to the past as a historical analogue, drawing on a period in the world’s climate that may be unlike what we’re ultimately going to see in the next century. In terms of past patterns of climate indicators, we’re reliant on patchy data and problematic definitions of core concepts like drought. The rainfall data that many of us use relied on rain gauge measures until the launching of satellites in the late 1990s. As Brad Lyon has noted, coverage of rain gauges over parts of the world like the Democratic Republic of Congo declined dramatically throughout the latter half of the 20th century. Data sources for the same region often show widely divergent rainfall trends. In terms of future projections of climate change, existing climate models still leave a lot to be desired. Most of them lack adequate spatial resolution to get at regional and national effects (see Biasutti and Paeth). These are the challenges just in terms of past and future physical exposure. Trying to trace these through to the social and political realm is as if not more difficult. Most of the articles that have emerged in this field have appeared in the last five years. The mechanisms and causal chains between climate effects in the physical realm to security outcomes are only hazily understood. The scholars in the JPR special issue are pushing the frontier of knowledge forward. Take, for example, the disputed connection between disasters and conflict. Two important studies by Brancati and Nel and Righarts found an association between certain kinds of disasters (earthquakes and rapid-onset disasters respectively) and conflict. The JPR special issue has two articles on disasters and conflict by Slettebak and Bergholt/Lujala that dispute these findings with respect to climate-related disasters. Both conclude that there is no direct correlation between climate-related disasters and the onset of conflict. Slettebak notes that the Brancati paper looked at conflict incidence rather than onset. If we are interested in how new conflicts start, onset is a better indicator. From his analysis of climate-related disasters, Slettebak concludes that they actually make civil wars less likely on the basis that desperate people tend to cooperate more. Bergholt/Lujala find similar results of no direct relationship between swift-onset climate-related disasters (thus excluding drought) and conflict. They then seek to ascertain whether there might be an indirect effect on conflict through economic growth, the logic being that disasters might negatively effect economic growth, which could, in turn, contribute to a greater likelihood of conflict. While they find that disasters do have a negative effect on economic growth, they do not find an effect on conflict through growth. They also challenge the conventional wisdom from Fearon and Laitin among other heavyweights in the field that declining economic conditions contribute to conflict. As my colleague Todd Smith has noted, the indicator of disasters they use — the population affected by a disaster — is not a physical measure exogenous to social conditions and governance but actually reflects an outcome measure of vulnerability in its own right. While flawed, this move to examine the indirect effects of climate-related indicators on conflict outcomes is a step in the right direction. This is exactly the approach taked by the Koubi et al. paper in the JPR special issue that looks at rainfall variability and the indirect effect on conflict onset via economic growth. Here, they find weak support for the links between climate variables and civil conflict in non-democratic countries, but a finding nonetheless. Because these are the first studies of this kind in a field that has focused on the direct effects on climate indicators and conflict, I expect that the evidence will get better as we have improved data sources, more refined methods, and new channels of influence on security outcomes via migration and food prices. In sum, we still have a lot to learn about how climate change will manifest as security problems. Government actors, including militaries, are approaching this issue increasingly with a desire to do something to address the problem. While it is always easy for an academic to recommend further study, understanding the nature of the challenges we face is an essential first step to effective and efficient expenditure of scarce resources. 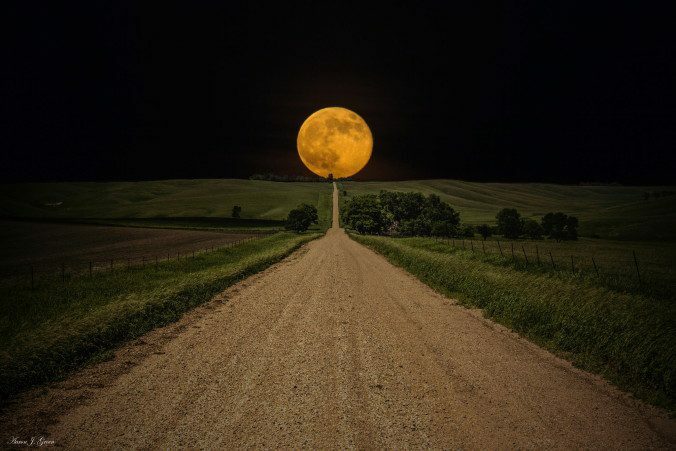 Preparing for a threat that may not materialize or may manifest in a different manner than was thought could lead to the careless diversion of funds for unproductive purposes. Outside interventions themselves may make the problem worse rather than better. Policies intended to anticipate future scarcities rather than the scarcities themselves may exacerbate tensions and lead to conflict as Asian investors’ efforts to lease agriculture land in Africa have shown. The Benjaminsen piece in the JPR special issue provides a cautionary tale. 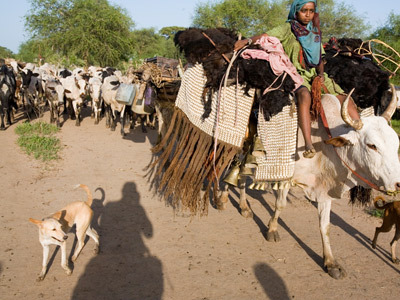 A Canadian funded dam rehabilitation project intended to deal with the resource constraints of pastoralists and semi-pastoralist communities in the Sahel ended up becoming the focal point for conflict between two communities. As we think about how to address the complex problems of climate and security, outside actors, militaries in particular, need to ensure that their interventions, based on good intentions or hastily put together policy prescriptions, don’t make things worse. This is not a recipe to do nothing. Far from it. One of the dominant themes of this entire literature is that physical exposure is not destiny. Governance and political dynamics are as, if not more, important in explaining whether or not environmental shocks, scarcity, and abundance lead to conflict. 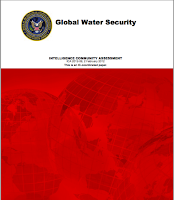 Moreover, as the literature on river basins shows (including De Stefano et. al’s masterful study in the JPRspecial issue), institutions can also mitigate and diminish threats posed by scarcity. As practitioners move forward in plans to address this looming threat, they can profit from an openness to new information and humility about what we do know. That shouldn’t paralyze us from taking steps that shore up resilience to diverse threats, whether or not they manifest in violence, but to tread carefully. I am entirely ignoring the issue of climate mitigation by militaries which are major users of energy. Sharon Burke’s office of Operational Energy in the U.S. Department of Defense has done admirable work to try to lessen the energy footprint of the U.S. military, in part driven by climate concerns but more importantly to leaven the battlefield costs both financial and human in trying to get fuel to troops in dangerous circumstances. Photo credit: lhgszch on Flickr. Back in December 2009, I wrote a post for the Duck called “Wal-mart Isn’t Green.” Jared Diamond had written a provocative op-ed about various green business initiatives for the NY Times and Steve Walt had blogged about it too. The world’s biggest corporation and the world’s most populous nation have launched a bold experiment in consumer behavior and environmental stewardship: to set green standards for 20,000 suppliers making several hundred thousand items sold to billions of shoppers worldwide. …one thing is already clear: how Walmart and China interact with each other over the next decade will be critical to the fate of the planet’s environment. 1. To be supplied 100 percent by renewable energy. 2. To create zero waste. 3. To sell products that sustain our resources and environment. I’d encourage everyone to read the piece to get a feel for the scope of the problem and for interesting discussion of the various initiatives underway. I’m primarily interested in the article’s conclusion. Will this work? However smart, prescient, and successful Walmart’s sustainability efforts actually turn out to be, just how “sustainable” is the whole bloody global-retail proposition that lies at the heart of the company’s amazing progress? In fact, one could say the same thing about China, which—after so many decades of defiant proletarian opposition to capitalism, consumerism, and American imperialism—has embraced the American-style market and is ardently following the Walmart path to prosperity. Indeed, allowing, even encouraging, people to consume as much as they want, or can, has become one of the Chinese Communist Party’s key strategies for political legitimacy and social stability. Party leaders may label their version of development “scientific” or “sustainable,” but it’s still development. The bitter reality is that even if unrestrained consumerism becomes less environmentally destructive per unit of production than it was in the past, it is still unsustainable in the long run. So even as this most innovative of corporate and statist green strategies may represent an environmental breakthrough and good business for Walmart, and good politics for the Chinese government, it may nonetheless end up being very bad business for humankind. In the long-run, consumers and businesses alike must figure out ways to operate sustainably. I suspect the phrase “global supply chain” isn’t going to fit into that plan very well given the inherently large volume of energy and other resource usage associated with moving and consuming products around the world, including food. With the rugby world cup semi-final only a few days away, it would take something like a broken ship dumping tons of oil and chemicals onto the country’s beaches to get the country to talk anything besides the All Blacks… Wait… New Zealand is all about environmental protection, green energy, clean air (and funny guys like Jemaine Clement from Flight of the Concords) isn’t it? I mean, what is a ship with oil even doing near this environmental mecca? Given that the country prides itself on its green and clean image, and given that there is an election in a month, you would think this would be a major story here. 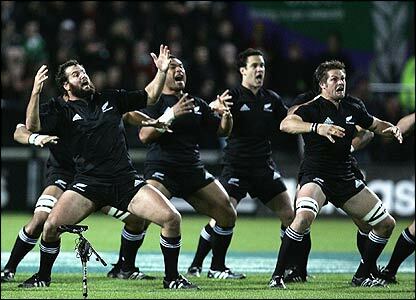 Yet, a week after a cargo ship loaded with oil and other toxic materials hit a reef off the cost of the North Island, most Kiwis are remain more fired up about the upcoming match between the All Blacks and the Australian Wallabies. No one seems to mind that the ship may break at any moment, or that it is dumping oil at a rate five times higher than originally projected. It took nearly a week before its major newspaper, the Dominion Post, featured the story on its cover (not a huge surprise considering that it recently featured a cover with two birds that collided mid-air and today is covering the story of a family that got lost in a corn maze in Massacusetts, of course). The gallons of oil dumping into the ocean and the apathetic media and public in New Zealand seems at odds with its lucrative 100% Pure tourism campaign. Perhaps this is Peter Jackson’s fault with the Lord of the Rings, or perhaps its just because the country is do damn far from everywhere else that few people actual get to check the place out and see if the reality lives up to the hype/myth. Having lived here for almost two and a half years now I can say with confidence that there are three myths associated with New Zealand that are just fallacy. 3. New Zealand is a feminist country, with progressive policies related to women. The first myth is the most important for the moment. The myth here is that New Zealand is not only clean and pure- it is cleaner and more pure than most other places in the world. By contrast to the stunning images of mountain ranges and untouched native bush and forest, an unfortunate reality is that New Zealand has increasingly relied on farming- especially diary farming- as a primary industry. This isn’t the kind of farming that involves a few dozen cattle crazing on pristine grass- it is a massive industrial, clear cutting, dirty industry. As for the last two myths- I’ll leave those for now because as a Canadian living in Kiwi-land I’m not exactly objective. Sorry New Zealand. You are truly amazing- beautiful, slow, and isolated- but like many countries, your myths are preventing you from dealing with reality. When the rugby world cup hangover subsides the country will have to wake up and face a serious environmental disaster washing up on the North Shores. Demanufacturing is the process of disassembling, recycling, remanufacturing, or refurbishing outdated industrial and consumer products, particularly electronics (i.e. e-waste management, asset recovery, or urban mining) but also including activities such as shipbreaking, automobile shredding, devulcanization of rubber tires, etc. The tail end of the capitalist industrial production process was traditionally relegated to developing countries in Asia, Latin America, and Africa as part of a broader ruthless and neo-racist practice of relocating polluting industries and processes in the periphery and semi-periphery. But demanufacturing firms are beginning to emerge in advanced industrial countries as a mechanism to ensure data security for e-waste, comply with environmental legislation/emerging global norms and conventions on toxic waste, make landfills more “efficient”, as well as to generate employment and profit from the re-use of lucrative materials. The problem of e-waste is obviously created by the failure of capitalist industrial production processes to incentivize green designs and to “internalize” post-consumption. While there have been some voluntary and state-led initiatives to push industries to design green by using the concept of Extended Producer Responsibility (EPR) for the End-of-Life (EOL) stage of a product, the manufacturing industry in sectors like telecommunications and personal computing seem to have increasingly moved toward planned obsolescence with narrower and narrower time horizons (i.e. the iFad syndrome). Nevertheless, even if green design is still a dream in some sectors, the tide is turning toward more responsible demanufacturing in most of the world with a few exceptions. Only Afghanistan, Haiti, and the United States have yet to ratify the 1992 Basel Convention on the Transboundary Movements of Hazardous Wastes and their Disposal. The US, Canada, and Japan still object to particular provisions of the convention which restrict the export of toxic materials from developed to less developed countries. The US also continues to use prison labor to demanufacture e-waste in order to avoid more restrictive labor protections afforded to the general workforce. Canada has ratified the Basel Convention but it uses dubious tactics to comply. (Canada’s questionable behavior on this issue is actually not too surprising — as those of us who live near mega-landfills in the US know — our friends to the north are more than willing to export their sludge to the US in order to make their own country appear “green” while harming their neighbor’s environment.) The domestic environmental lobby in the US, Canada, and Japan will need to be energized on this issue to compel adherence to the international convention. Meanwhile, the EU has moved toward the adoption of a complete ban on the export of toxic materials to developing countries. While preventing the export of toxic e-waste to LDCs is laudable given the enormous health and environmental impacts and the incapacity of many of those states to enforce environmental regulations, there is still a need to share best industry practices, technology, and equipment in the demanufacturing sector with LDCs as they attempt to deal with their own share of e-waste. India, for example, generates approximately 800,000 tons of e-waste per year. Otherwise, the environmental movement against e-waste becomes little more than an attempt to use legislation to create/protect a new industry in the OECD countries without regard for a comprehensive global solution. The Preamble and Articles 10 and 14 of the Basel Convention do recognize the need for establishing regional and sub-regional technology transfer centers for the management and minimization of hazardous waste, but the obligation is completely voluntary on signatory countries. The question of human over-population of our planet seems to resurface every few decades, driven by fears that there are too many people to feed, clothe and shelter, or that the sheer volume of human beings working, travelling and polluting is causing environmental damage. But the persuasiveness of such claims is weakened empirically and normatively. In terms of facts, it does not help the over-population claimants that every time the population question is raised, humanity seems to deal with the problem. People do find food, clothing and shelter. And in terms of values, the notion of limiting or reducing the number of human beings appears a slippery slope to calls for coercion and perhaps eugenics in the name of ‘the greater good’. But in 2010 the question is being asked again. At Royal Holloway last night, Professor Diana Coole presented early analyses from her new three year project, Too many bodies? The politics and ethics of the world population question. She is interested in why the question is re-emerging now and why it is in developed countries that calls are loudest for something to be done, according to her analysis of media and policy documents. Size of world population seems to have causal links to the development of climate change, water and food security, managing waste, and preserving diversity. The Royal Society’s working group People on the Planet raises this explicitly, as did the Stern Report – though neither recommended any proposals to intervene in human population numbers. As Coole argued, the tools we have for managing demography – fertility, mortality and migration – are all political minefields. Governments quietly manage birthrates through tax and welfare regimes and campaigns on family planning, but few policymakers in liberal democracies would explicitly institute a one-child or two-child policy for families. It is interesting that Coole, a critical theorist in the continental tradition, should be asking why the population question remains a taboo. Materiality, vital matter, the non-human and post-human futures have all been on the critical theory agenda recently, in IR and more broadly. People are not the only things that matter. This scholarly focus parallels public-political claims for ‘sustainability’ in which the maintenance of ecosystems are considered more pressing than the continuation of humanity and certainly more pressing than economic growth. Might it be that a new strategic narrative will be formed and brought to bear on policy, a ‘smaller, better humanity’ narrative? Population projection statistics are ambiguous and can easily be used to support Malthusian stories. And Coole’s project may unpick the factual and normative discourses that silence talk of the population question, so that the better-smaller narrative — if that is what is being formulated — can be heard. Environmentalists frequently point out that Wal-mart’s alleged energy savings are designed only to save the company money. Consumers (more and more all the time) have to drive great distances to get to Wal-mart and thus more than make up for whatever conservation the company achieves. Moreover, as I noted in mid-October, Wal-mart has essentially outsourced serious environmental costs to China. The company’s world buying headquarters is in Shenzhen, an industrial city of more than 10 million people that is part of a “special economic zone” in China. As a result of lax environmental standards, the United Nations Environment Programme reported in 2007 that Shenzhen is heading for ecological disaster. Wal-mart’s business practices (including its low prices) have serious adverse ecological consequences that cannot be readily countered with corporate cost-cutting measures that also happen to save energy. Decades of war and mismanagement, compounded by two years of drought, are wreaking havoc on Iraq’s ecosystem, drying up riverbeds and marshes, turning arable land into desert, killing trees and plants, and generally transforming what was once the region’s most fertile area into a wasteland. Falling agricultural production means that Iraq, once a food exporter, will this year have to import nearly 80% of its food, spending money that is urgently needed for reconstruction projects. “We’re talking about something that’s making the breadbasket of Iraq look like the Dust Bowl of Oklahoma in the early part of the 20th century,” said Adam L. Silverman, a social scientist with the U.S. military who served south of Baghdad in 2008. Indeed, the Iraqi area between the Tigris and Euphrates Rivers used to feed much of the Middle East. No more. [Iraq’s] Agriculture Ministry estimates that 90% of the land is either desert or suffering from severe desertification, and that the remaining arable land is being eroded at the rate of 5% a year, said Fadhil Faraji, director-general of the ministry’s Department for Combating Desertification. Nor does this history of mismanagement relieve the U.S. of its responsibilities here. In IR, much of the research on ecology and security has focused on the possibility that “environmental scarcities” contribute to the outbreak of violent conflict. It would appear as if additional research should focus on the environmental harm of war itself — and the difficulty of making critical green choices in a war context.